HOW ARE THE CDS SHIPPED? DO YOU SHIP OVERNIGHT OR INTERNATIONALLY? HOW LONG DOES IT TAKE FOR THE CDS TO ARRIVE? We ship CDs throughout the U.S via First Class Mail from the U.S. Postal Service, and to Canada for an additional charge due to extra postage and customs processing fees. CDs normally ship by the end of the following business day and can take up to a week to arrive via First Class mail in the U.S. and up to 10 days in Canada. (Delivery times are normally faster, but we’d rather be more conservative with our estimates just in case.) We apologize but overnight or express shipping is not available. YOU OFFER THREE DIFFERENT CDS - WHICH SHOULD I CHOOSE? ARE THE CDS AVAILABLE ON ITUNES? While we are unable to offer gift wrapping services at this time, You WILL have the opportunity upon checkout to include a brief gift message. IS IT SAFE TO ORDER AT THIS SITE? Rest assured that this site is protected by the very latest in security technology and that we will never sell or release your information. We value your business, respect your privacy and will take the utmost care with any data you input at our site. CAN I BUY THE CDS AT WALMART OR TARGET? 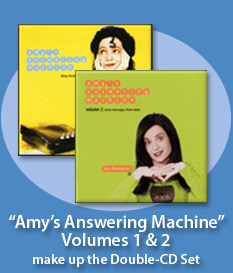 Amy's CDs are not sold in stores at this time. Sure. (But no personal checks.) To pay by U.S. money order, choose a product and follow the online order process to learn total price with shipping and tax (for orders sent to New York only). Print order form or send name, address, day and evening phone, shipping address, email addresss, and U.S. money order only payable to Amy Borkowsky Productions, Inc. (Orders submitted with this method can take a bit longer to ship.) P.O Box 1894, Murray Hill Station New York, NY 10156. 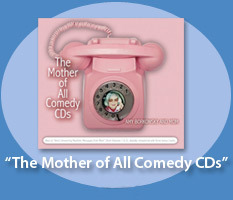 The quickest and most economical way to get your CDs is by ordering online. (Web specials apply only to internet orders placed here; phone orders are processed at regular price.) If you'd still like the comfort of ordering via a friendly human, our number is 212-481-2979. OPERATORS DO NOT HAVE ANSWERS TO YOUR CD QUESTIONS OR ACCESS TO ORDERS ALREADY PLACED. We'll be happy to provide support for previously placed orders and to answer any questions about our products if you write to MomCDSupport@gmail.com, and we normally respond within 24 hours. We accept most major credit cards but are not accepting PayPal at this time. Email MomCDSupport@gmail.com, and we'll be happy to help you out.